At Black Hat 2013, McAfee polled attendees to see where they struggled with the advanced malware used in low-prevalence and targeted attacks. While detection led the list of challenges, false positives, protection, and timely response and repair represented huge frustrations—and huge costs as well. 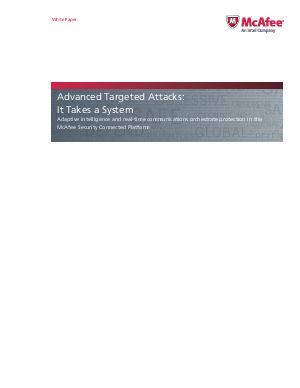 However, with McAfee® Threat Intelligence Exchange and the McAfee Security Connected Platform, security professionals now have a high-performance system that integrates workflows and data to overcome siloed operations and shift the model to agile, intelligent threat prevention.